Some Ontario lawyers who left no lasting mark on the practice of law in the province nevertheless have reflected well on the profession by making a contribution in other areas of Canadian life. One such example is Elkanah Billings, who practised law for less than a decade before he abandoned the legal profession first for a career in journalism, before making his real mark as a geologist and paleontologist. Today he is remembered as the father of paleontology in Canada, and is famous in geological circles, although largely forgotten in legal ones. The son of loyalists who fled New England for Upper Canada after the American Revolution, Elkanah Billings was born near Ottawa in 1820, one of nine children born to the family. Educated first locally, then at Ottawa and Potsdam, N.Y., his name was entered on the Law Society of Upper Canada's roll of students-at-law when he was 20 years old, and he was called to the Bar in 1844. He practised law in Bytown (as Ottawa was then called), and in Renfrew, a town in the Ottawa Valley. By 1852, Billings had practically abandoned his legal practice when he was appointed editor of the Ottawa Citizen. While with the newspaper, he began to collect local fossils and to write on geological topics. He published his first paper on the new field of paleontology in 1854, and two years later founded the Canadian Naturalist and Geologist, which he edited and to which he contributed prolifically. Self-taught in the natural sciences, Billings had found what became "the ruling passion of his life," according to an obituary published in the journal he had founded. At the Law Society Archives, we knew very little about Elkanah Billings until a researcher, lawyer Jeffrey Minicucci, called to inquire about him. We are grateful to Mr. Minicucci for bringing Mr. Billings to our attention, and for his comments and suggestions on an earlier draft of this piece. 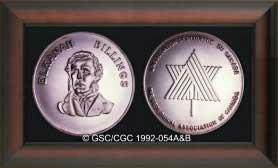 Photographs of Elkanah Billings and the Billings Medal are reproduced with the permission of Natural Resources Canada 2008, courtesy of the Geological Survey of Canada. The biographical information used here appeared in three sources: J.F. Whiteaves, "Obituary Notice of Elkanah Billings, F.G.S.," The Canadian Naturalist and Quarterly Journal of Science , Vol. 8, No. 5 (July 1877): 251-261; the Dictionary of Canadian Biography Online ; and a biographical sketch of Billings from the Geological Survey of Canada website. 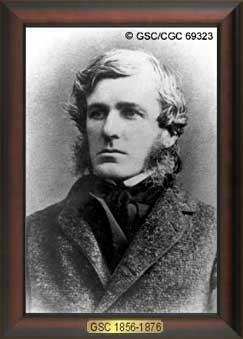 In 1856, Billings was appointed the first Paleontologist to the Geological Survey of Canada, based in Montreal, where he lived for the rest of his life. While he held that post, he performed the great undertaking of describing and cataloguing the extensive collection of fossils from Upper and Lower Canada in the Survey's holdings, and continued his own field work and writing. During his career, Billings discovered and described more than 60 new genera and 100 new species. The sheer volume of his production was matched by its variety. His description of fossils ranged from various marine creatures, like trilobites, brachiopods, and crinoids, to large mammals like the mammoth, the mastodon, and even a beluga whale. His work on the fossil echinoderms, marine animals such as starfish and sea urchins, remains his principal legacy. Billings died of Bright's Disease in 1876 at the age of 56. An obituary attributed his success partly to hard work: "He possessed a capacity for brain labour such as falls to the lot of few, and taught himself enough of German, Norwegian, Swedish, and Danish" to be able to write essays on paleontology in those languages. His character, according to the writer, "was marked by great firmness and decision, by an unswerving love of truth and justice, and by an unaffected and winning modesty of demeanour." Billings is buried in Toronto. Title page of first issue of the scientific journal Billings founded. Billings's contributions as a pioneering naturalist are honoured in the geological and paleontological communities. A geological formation in the Ottawa region is known as the Billings Formation. The Paleontology Division of the Geological Association of Canada acknowledges outstanding contributions to Canadian paleontology with a prestigious award called the Billings Medal. His early career as a lawyer is mentioned in biographical sketches of him, but represents little more than a footnote in his life. Still, the mental discipline and skills he had learned in his legal training and in the practice of law undoubtedly stood him in good stead in his subsequent careers.